This bird comes courtesy of… well… Texas. I know, that isn’t too specific being our largest state, but a bit of a confession is due here. I can’t remember where this bird was photographed. Usually when in doubt I can triangulate with shots before and after it. This time, that didn’t help as these shots were isolated from the others. Somewhere along the Texas Gulf Coast (guess I can narrow it down a bit) this bird caught my eye and made its way into the tin. I do recall taking a minimal number of shots wherever that was thinking it was a young or female Robin that had not yet developed its rich orange and brown hues. It was not until the digital darkroom that it became apparent that this was NOT a Robin. Nope, this is an American Pipit. 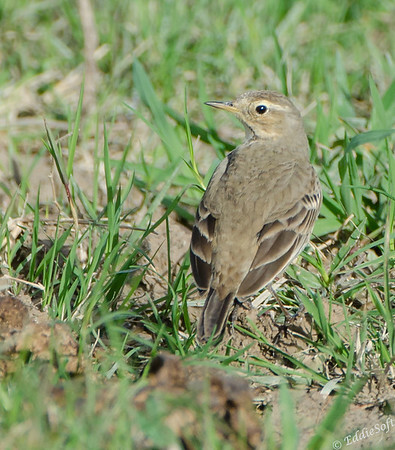 Let me restate that – this is my FIRST American Pipit. Now that I know what to look for in the field, hopefully I’ll be able to bring you back a better set of pictures and the additional perspectives. Have to go with what I have today which is sufficient to give a proper ID. Being a new bird, let’s quickly see what interesting facts to pass on. Cornell indicated that it appears similar to Sparrows, but made no mention of it being confused with Robins. Odd since there was no confusion here that it wasn’t a Sparrow. Some of my readers across the pond may recognize this species as the Water Pipit. Our varieties used to be lumped with that species, but it was determined that the North American variety and the Eastern Asiatic species were different than the Water group and thus separated out into distinct species. Really, that is the most interesting facts Cornell has about this bird other than some story about 17 being buried in a snowstorm in Wyoming. Weak. All I have for you at the moment. Legs need a rollout from the back to back runs this weekend and need to get ready for a couple of presentations for my day job scheduled for tomorrow. Stay safe everyone! Thanks for placing me back in my routine…morning coffee and reading your blog, learning about birds. Now I have to do some research. I’m trying my best! bet you are researching what happened to those 17 birds ha! – thanks for checking in. Nice! 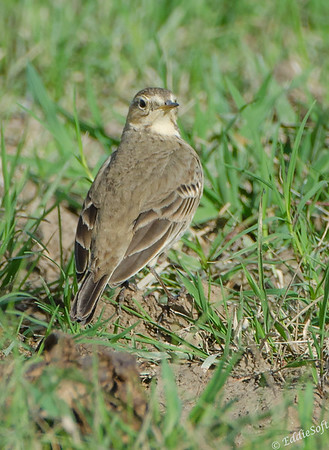 I got pictures of American Pipits in the spring of 2017 in a field next to a small hotel I was staying at somewhere in Southern California before heading up to Yosemite. That little dirt field and the pond next to it were shockingly great for birds, as I recall. I think I actually got another new bird there, too. Something in the pond, I think. Weird. Anyway, as you say I’ve probably mistaken them for American Robins as well, so I’ve noted your three-item list so I’m sure next time. I’m surprised you didn’t research the 17 Pipits that were buried in the snowstorm in Wyoming…what a human interest story! 🙂 FYI, the relevant article, “Effects of a Severe Snowstorm on Subalpine and Alpine Populations of Nesting American Pipits”, appeared in the Journal of Field Ornithology in 1992. Spoiler: “younger nestlings apparently died of exposure”, and more of the alpine than the subalpine. Thanks for the post! If I hadn’t lucked out by going birding next to a hotel along the highway I would have been very jealous! Wait a minute.. were you in California for “birding” or a family event. Unfortunately, by our well established and agreed upon rules, if you were there for a family event you will have to forfeit the ticks. I do feel bad for you. I did look into the 17 birds and decided I would shield my readers from the sadness…and what turned out to be a predictable outcome. Now you have gone and depressed everyone – bad Ron, very bad Ron. I kid of course (on the spoiler, not the birding rule). Always love it when a comment turns out longer than my actual post. Appreciate your sharing your thoughts. Look’s a bit different from ‘our’ Water Pipits, wondering Buff Bellied Pipit (Anthus rubescens)? which has appeared over here though I’ve yet to see one. 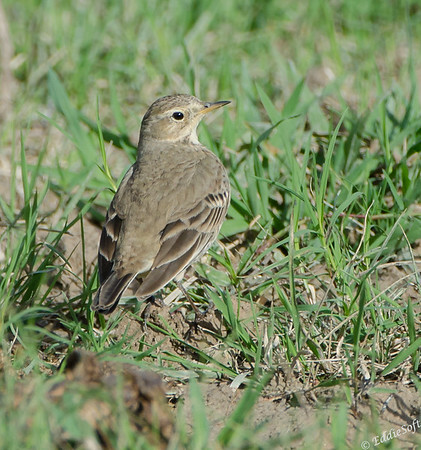 Never heard of a Buff Bellied Pipit – Cornell didn’t list it or the Audubon app. Eventually found a reference to it on Wikipedia – looks like that is the alias of (same species as) the American Pipit so you are correct. Curious I then went and tracked down the Water Pipit on Google Images – looks darker than our variety and does have more of a Sparrow look in my opinion. Thanks for stopping Brian, appreciate the comments! Also in spring the Water Pipit migrates from the UK to Alpine meadows to breed, it’s plumage changes to a pale blue head and pink breast, very smart.